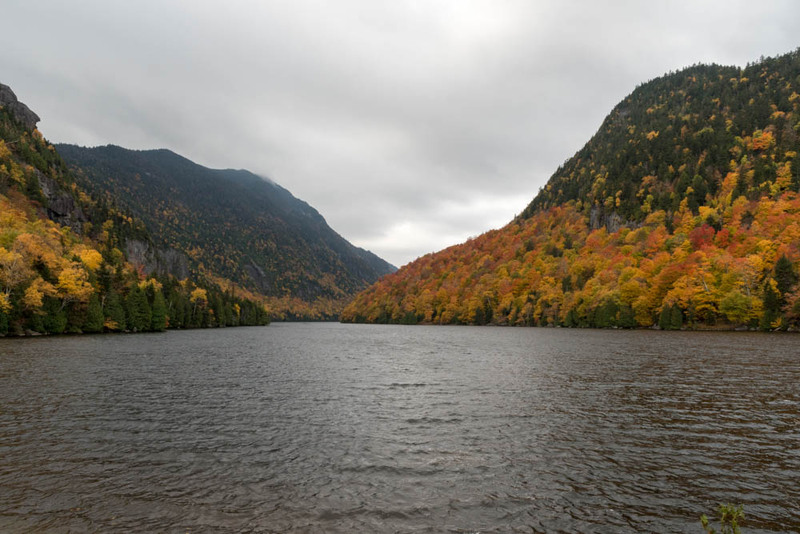 I’ve been hiking in the Adirondacks for well over forty years – or so I like to think. 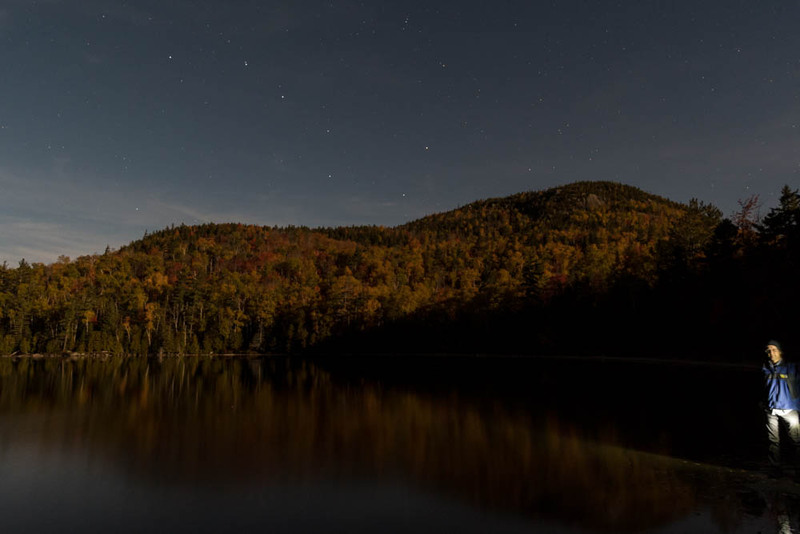 Actually, I can count on one hand the number of Adirondack peaks I have summited in the past quarter century – all but one of which are small viewpoints outside the classic canon of the ADK 46, the elite group of peaks over four-thousand feet in elevation. (A historical curiosity, three of the peaks on the list of 46 have since been re-surveyed and found to be shy of 4000′ elevation, but remain on the list for ol’ times sake.) I spent the summers of the 1970s hiking these peaks with my family, and the winters of the 1980s exploring the snowy backcountry with my high-school and college buddies. My last backpacking trip here was in 1990. Recently, I found myself drawn back to these ancient peaks – for they are far older than the Appalachians, and reside deeper in my own past – with an eye toward notching off the final dozen peaks on my own list of 46. I set aside three days on my calendar and struck out at dawn on Friday, with three specific summits in mind, and was rewarded with breathtaking scenery, fond memories of trips long past, a rekindled appreciation for this beautiful wilderness, and lovely photos. More after the break. Heart Lake near Adirondac Loj. Roadside home and tree, along the road in Vermont. Friday. 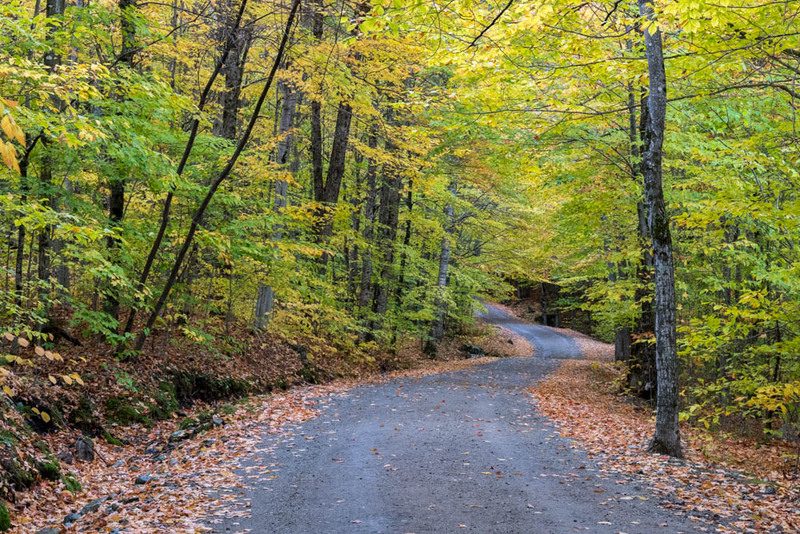 The early morning drive westward across Vermont was itself a spectacular experience, necessitating numerous stops to soak in the view of Fall colors basking in the glow of the sun rising behind me, and a quick attempt to capture some of that splendor to share in my Fall gallery. Driving across-the-grain of Vermont means climbing over two mountain passes, meandering through small villages, skirting valley farms, and watching the hawks and vultures soaring over the plains of the Champlain Valley (one in particular, was circling a red fox along the roadside). I arrived late morning at the Adirondac Loj – serving guests since 1885! 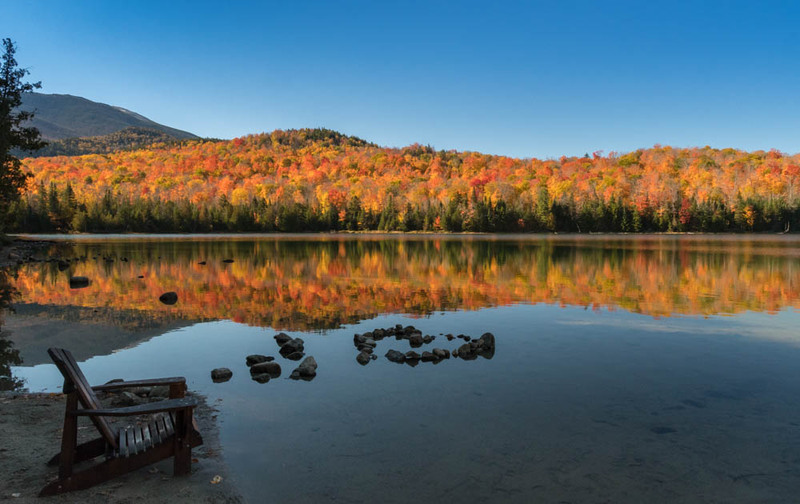 – nestled next to Heart Lake in, well, the heart of the Adirondacks. The sun was shining, the sky a brilliant blue, and the leaves of autumn glowing along the lake shore. A beautiful day for mountain-top views! For me, though, my target was a pair of trailless, viewless bumps called Street and Nye. I have vague memories of a drizzly August day, many years ago, when my father and I used our map and compass to follow the small brooks that drain these twin peaks to the summit of Street. It was buggy, and misty, and cold, and the summit itself was a cramped space among the firs and spruce. We ate a quick lunch – accidentally leaving behind my pocketknife – and decided to leave Nye for another day. It would take 36 years before I managed to return. Scene along the trail to Street & Nye, Adirondacks. Today, on this sunny fall day, I followed a clear guidebook description of the “designated” herd path through the colorful fall woodland and up into the col between Street & Nye. 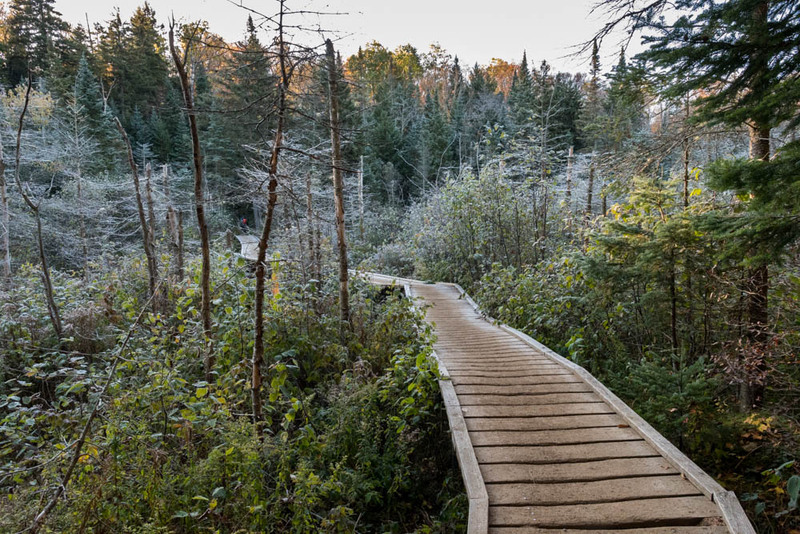 So many people climb these peaks that they are no longer “trailless” – they have a “minimum maintenance” trail, designed to concentrate the impact but minimize the effort required to maintain the trail. Although the colorful and fresh leaf litter made navigation a little tricky at first, I reached the viewless summit of Nye in two hours, snapped a photo, and traversed one mile over to the summit of Street. I looked briefly for my pocketknife – a silly whim – and strolled a few yards to a nice view of the Algonquin range through the trees. I saw six people (and three dogs) in four groups, on their way to Street or Nye, even though I was only there for about 4 hours. Distance: 9.0 miles; elevation gain: at least 2,100′. Time: ~5:00 total. Adirondack Loj at Heart Lake. I stayed overnight in the Loft at the Adirondac Loj. What a way to hike! 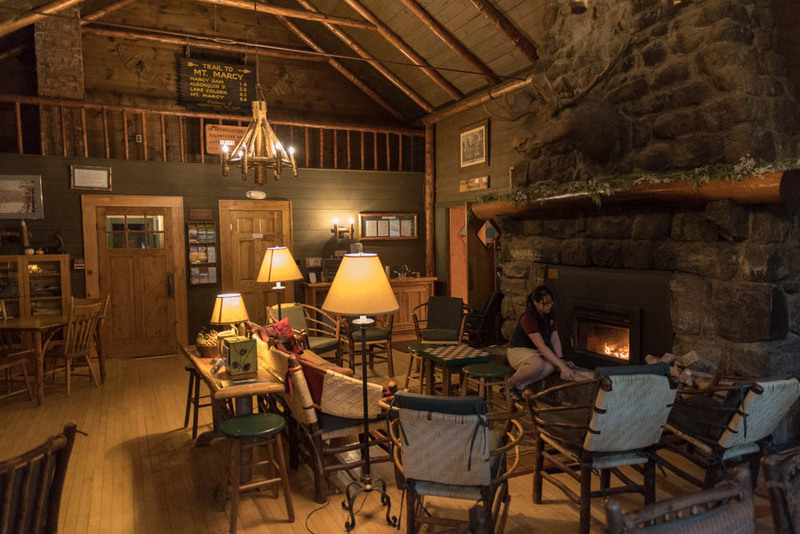 A hot shower, a cold beer, a hearty dinner, a cozy common room with friendly banter among the hikers, a Wi-Fi connection to share a few photos, and a warm bed. 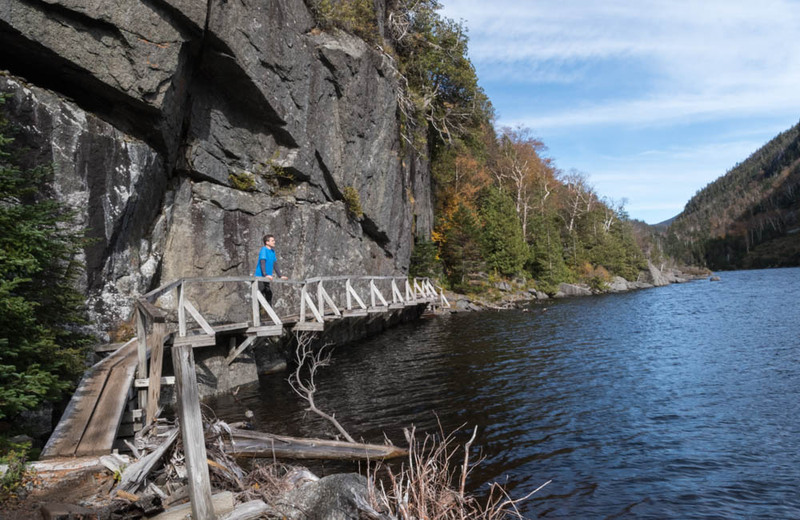 Run by the Adirondack Mountain Club and open since 1885, I can’t recommend it more. A frosty bridge over a bog near the beginning of the trail to Marcy Dam. Saturday. The clear night lent me a nice opportunity for star photos last night, but this morning it means frost and 26 degrees. Still, after a hearty breakfast in the Loj, and some sunrise photos of Mount Jo over Heart Lake, I’m off to find the trail to Marcy Dam. After passing a large tent for a CollegeOutside weekend meeting, and another tent where sturdy volunteers are stoking up for ADK Trails Weekend, I sign in at the trail register; when I return, I will count over 400 groups registered today – close to 1,000 hikers, on one day, at one trailhead. The Adirondacks have gotten a lot more crowded! Hikers on the summit of Tabletop mountain. My goal for the day is Tabletop Mountain. 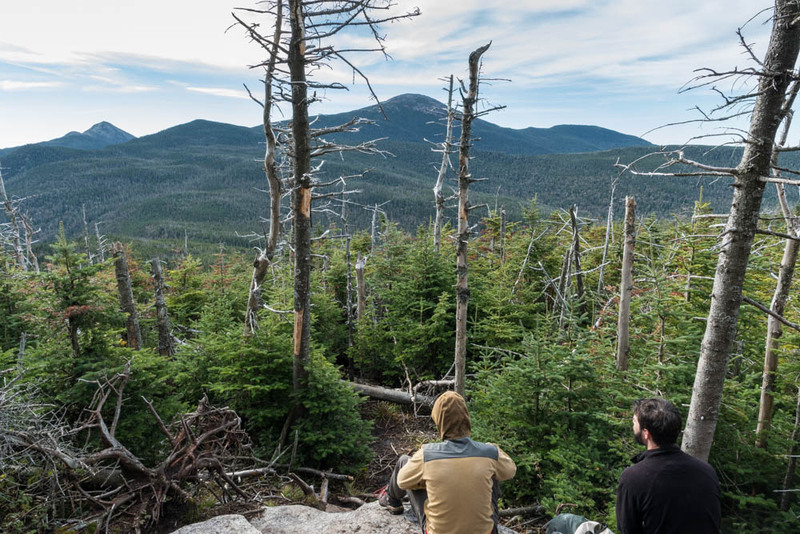 This non-descript peak is a bump beside the trail to Mount Marcy, less than a mile off the main trail. Still, it’s over four miles just to reach that junction, then a 0.7mi scramble along a steep, eroded, and over-used trail from there to the summit. (In my hour on the spur trail I encountered nine people on the trail and another eight people on the summit; clearly, “trailless” peaks are now common fare.) One advantage to the heavy use is that, over time, a decent view of Marcy has opened up to one side of the summit. David on “hitch-up Matilda” bridges alongside Avalanche Lake. 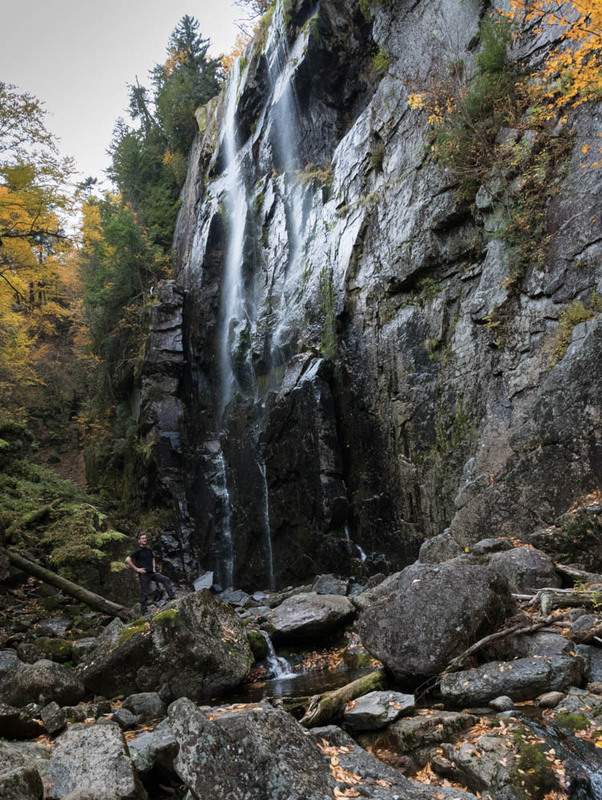 I drop back down to the main trail and hop over to Indian Falls, where I sit for a bit and enjoy its spectacular view of Colden, Iroquois, Algonquin, Wright, and more. It’s not even 11:30 and, munching my lunch and still feeling strong despite 5.7 miles under my feet, I decide to find another target. Mount Marcy? whew, it looked windy up there and all the fall colors are down here. I see a trail from Indian Falls down to Avalanche Lean-to, and decide to head for Avalanche Lake, one of my favorite places in the Adirondacks. What a treat! I descend, take a shortcut on the skiers-only trail, and back up to Avalanche Pass, now 25 feet higher since a fresh slide filled it with debris in 1999. Avalanche Lake is deep, very deep, with sheer cliffs rising along both sides. I clamber around the shore of the lake, over boulders and up ladders that challenged me as a small child, to the “Hitch-up-Matildha” bridge bolted to the cliffside. On this brilliant sunny day, with golden leaves decorating the shoreline, I think back to days when my family made its way along this same trail, and to winters in the 1980s when I walked across the frozen lake with my Choate and Dartmouth friends. Stars over Mount Jo, illuminated by the Full Moon – with David jumping into the frame. The hike out from here is long but beautiful in the afternoon glow, past the drained remains of Marcy Dam, and through the sunny forests close to Heart Lake. I stayed again at the Loj, in the bunkroom; after dinner I enjoyed the bright full moon rising behind the Loj and illuminating Mount Jo. Distance: 13.4 miles; elevation gain: at least 2,762′. Time: 7:05 total. Pretty fall colors, along Lake Road into Ausable Lake. Sunday. A blanket of overnight clouds makes for a warmer morning, in the low 50s, but also to a chance of showers. I have an ambitious day planned and I hit the road after a quick breakfast, just as the sun begins to rise. My goal today is Sawteeth Mountain, so named for its bumpy ridgeline. 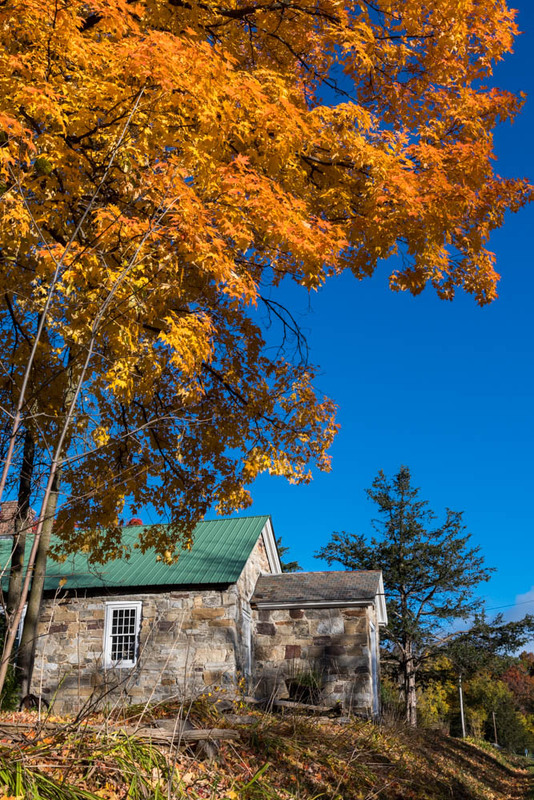 The drive from the Adirondac Loj through Keene and Keene Valley into the Ausable valley is beautiful, the road clinging to the cliffs alongside the Cascade Lakes and Chapel Pond, with the rising sun illuminating the colorful trees on the hills. 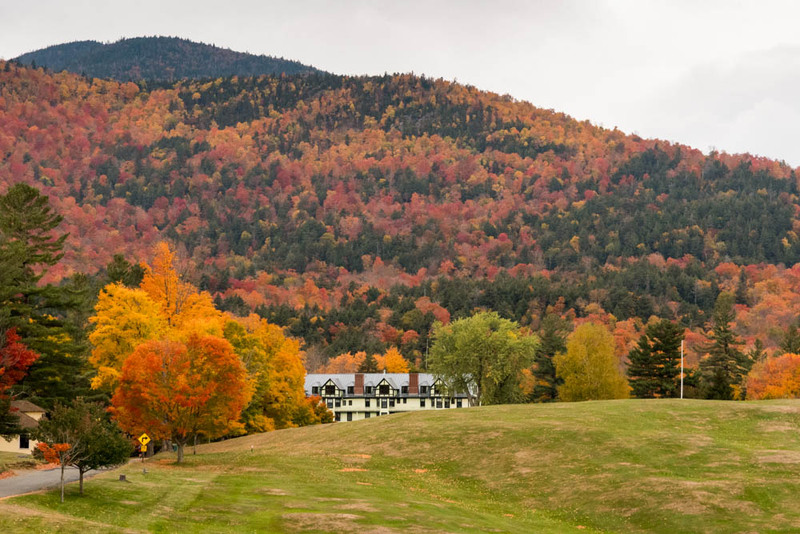 The Ausable river valley is a private inholding of the Adirondack State Park, known as the Adirondack Mountain Reserve, and its entrance is dominated by the Ausable Club, a members-only mountain lodge with private homes scattered around its golf course. They allow public access to their backcountry trails, but it’s now a half-mile walk just from the parking area to the gate. Indeed, I have four miles of road walking before I even reach the Sawteeth trailhead; at least this road is dirt and relatively level, with access limited to members (only two cars passed me in my eight miles of walking). Indeed, walking the Lake Road in Fall foliage is a beautiful outing in itself; despite many attempts at photography, with satisfying results, I don’t think one can truly capture the grandeur of the feeling when surrounded by so much beauty. Lower Ausable Lake, from the boathouse area. Lower Ausable Lake, from Outlook #1 on the Scenic Trail to Sawteeth. I arrive at the tip of Lower Ausable Lake. 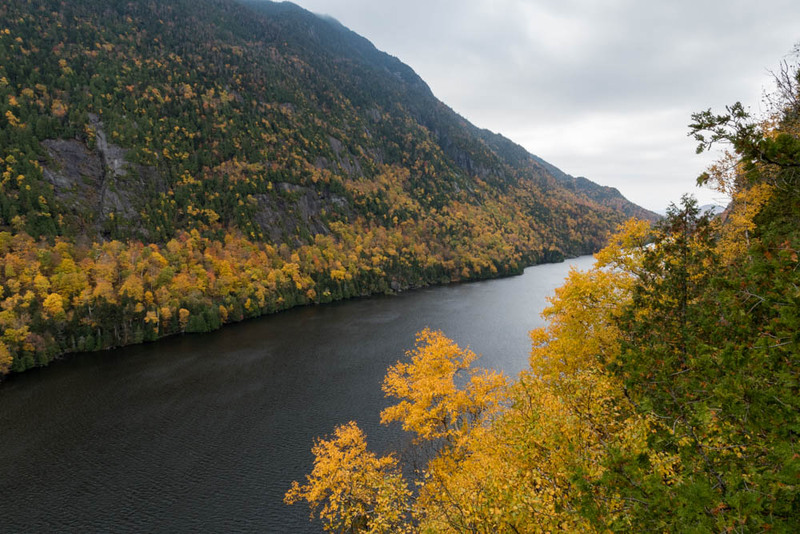 These twin lakes are, like Avalanche Lake and Lake Colden, deep clefts in the mountain terrain — deep, narrow lakes with sheer cliffs on both sides. Today there is a stiff breeze racing across the lake toward me, whipping up small waves and pushing a low deck of clouds across the summits above. A slash of color – gold, orange, and red leaves – decorates the opposite shore, and I cross the bridge to begin my climb. The “Scenic Trail” up Sawteeth scrambles along this shoreline, over boulders and through deep leaf litter, for half a mile, then slabs slowly up the steep hillside for another half mile, reaching an outlook that truly took my breath away. From here I can see the length of the lake, with intense golden birch trees popping in color against the backdrop of green firs, gray cliffs, and dark waters. Aptly named, the Scenic Trail has five such outlooks, which is fortunate because the trail between outlooks is one of the steepest, roughest, toughest climbs I’ve ever made. After Outlook#5, I climb into the clouds, climb over one of the “sawteeth”, and reach the summit at noon. The guidebook tells me of a spectacular view of the Great Range, but all I can see are the surrounding clouds. I finally climb a tall peak with a great view, and it has to be a day when the cloud ceiling is below 4,000′. Sigh. Fortunately, there is another trail down, avoiding the need to descend the rough and slippery Scenic Trail, and it’s nearly a mile shorter! 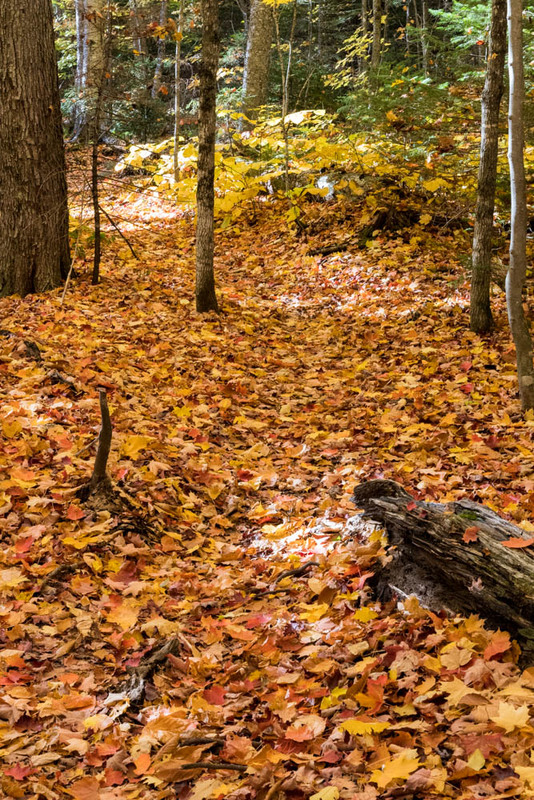 This trail quickly drops back down into the hardwoods and makes for a quick tramp downhill through the golds and oranges of autumn. As a bonus, it terminates near Rainbow Falls, a stunning cascade well worth its little spur trail. If the sun were shining at the right angle, I can easily imagine how rainbows would decorate its verdant cliff. In the photo at right, I’m just barely visible to the left of the base of the falls. 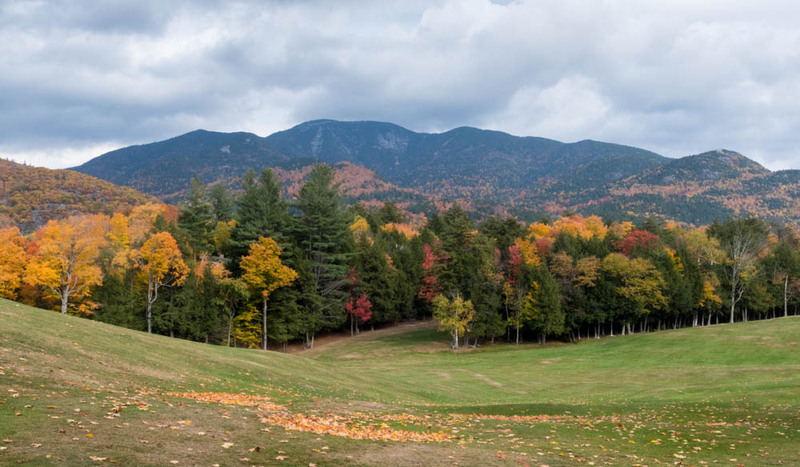 Giant Mountain from Ausable Club. I step quickly back along the Lake Road toward my car, covering four miles in an hour despite my frequent photographic pauses. The sun emerges among hints of blue sky, and I think back to that summit and wonder whether it might be opening up. A broad view of Giant Mountain, one of the tallest, greets me as I emerge from the forest and back onto the club’s golf course. Sawteeth, much lower, must now have its views back. Sigh. Actually, I’m happy to be down here in the fall colors, with many hours of daylight remaining for the pretty drive back across Vermont. I decide to slow down, and stop for lunch at the Noonmark Diner in Keene Valley, where I can study the trail map and dream about my next visit to the ‘Dax. Distance: 13.6 miles; elevation gain, at least 3,125’. Time: 6:20 total. Don’t miss the photos on SmugMug. This looks like an amazing hike!